This isn't the sound of "indie rock", nor is it "dad rock". This is "obligation rock", a forced brand of music that exists just because it has to. Kintsugi may very well go down as one of the most depressing rock albums of all time. No, not because of any sort of notable catharsis it achieves, but because it actually captures the sound of a rock band giving up completely. Let's not forget that for a time, Death Cab for Cutie were the easy populist figurehead of what qualified as "indie rock" in the early aughts, reaching their critical peak with 2003's Transatlanticism. During that time, Ben Gibbard's LiveJournal-ready lyrics and the band's deft melodicism helped soundtrack an untold number of dorm room heartbreaks. Even when they moved to Atlantic Records, not much changed about their refined aesthetic; their somewhat grittier 2008 set Narrow Stairs even managed to shake up their sound a bit while simultaneously topping the pop charts. They would soon be usurped by the likes of Arcade Fire as the "indie" rock group du jour, but from where Gibbard and his cohorts were sitting, this wasn't a problem. They managed to gradually slide into the mainstream without any notable fuss or controversy. In recent interviews, Gibbard has been lightly dancing around the accepted fact that 2011's Codes & Keys was a terrible album. Critics hated it, fans hated it, and it significantly damaged their reputation. Gone were the witty character studies and quotable couplets that put Gibbard on the map as a songwriter, and in its place were detached generic sentiments that lacked any real punch or consideration. Gibbard turned into a Diet Matt Berninger in the worst possible way. Codes & Keys is the sound of a band feeling bored with where they were, which is perhaps why they took so much time doing anything else but Death Cab between sets. Gibbard released a pleasant-but-forgettable solo disc, toured with the Postal Service to celebrate the ten-year anniversary of Give Up, and even scored a Lynn Shelton movie, 'cos why the hell not. While fans (but mostly critics) will want to try and some way to contextualize Kintsugi in the wake of Gibbard's divorce from actress Zooey Deschanel and the much-balyhooed announcement that longtime guitarist/producer Chris Walla effectively left the group following the album's recording sessions, doing so will prove to be a rather fruitless activity. Despite the small bits of distorted keyboard noodling and Robert Smith-indebeted guitar tones that pop up now and then, Kintsugi is a flat, lifeless disc, bland in the places where Codes & Keys was just poorly executed. Producer Rich Costley's résumé includes acts like Foster the People and Chvrches, groups that benefit from glossy, slick production. On Kintsugi, Costley produces every song within an inch of its life, keeping Gibbard's voice from ever being engaging and the overall sonic palette roughly the same on a track-by-track basis, which in turn makes Kintsugi's songs blur into bland midtempo mush. Admittedly, Costley may very well be doing the best with what he can, because by and large, Gibbard's songs simply don't have a pulse. Strangely, some of his lines work better on paper than they do in performance. The chorus to "No Room in Frame" ("Was I in your way / When the cameras turned to face you? / No room in frame / For two") has bite to it, but when sung in Gibbard's everyman tenor, the venom is missing. Even taking the dregs of Codes & Keys into consideration, Walla at least knew how to produce for Gibbard's voice, letting that land first and then building the atmosphere around it. Costley does the exact opposite of this, treating Gibbard's vocals like an afterthought, adding in light echoes and reverb so that his words don't necessarily have to engage the listener, when in fact that's why most people got turned on to Gibbard in the first place. That being said, at least Gibbard manages to land a few solid zingers on "Good Help (Is So Hard to Find)", attacking the fakeness of the L.A. lifestyle much as he did on The Photo Album's "Why You'd Want to Live Here" 'lo those many years ago. This time, he opens with: "You'll never have to hear the word 'No' / If you keep all your friends on the payroll." Yet by the time he shuns someone for finding "El Dorado" over in Culver City, Gibbard's bitter-old-man conceit has grown tiresome, especially when coupled with "Ingénue", another vague jibe at Hollywood phonies, at one point asking the title character "What will be come of you / When age's glacial pace / Cuts valleys into your face?" Much like with Codes & Keys, Kintsugi's songs have little aim or direction, almost as if Gibbard has completely forgotten how to instill his work with purpose. The album's nadir, the overwrought weeper "You've Haunted Me All My Life", attempts to achieve profundity by simply repeating the title ad nauseum, a cheap ploy which offers few rewards, as Gibbard has never had to do something so base to get his point across. Even the album's dramatic midpoint, the voice-and-acoustic ballad "Hold No Guns", rests on tired chords and metaphors too confusing to be effective. It's a song that's so poorly executed one has to wonder whether or not Gibbard even cares anymore. By the time he starts describing his lover photo-shaming Atlas through text messages on closer "Binary Sea", it's obvious what the answer is. This is the sound of Gibbard simply giving up. Kintsugi does manage to land the occasional win, whether it be the energized chorus to "The Ghosts of Beverly Drive" or the PG-rated Pinkerton that is "Little Wanderer", but these are modest victories at best. Kintsugi is the sound of a group resting on its laurels, the electronic squiggles that color songs like "Black Sun" being nothing more than distractions from the fact that Benjamin Gibbard's muse has left him long ago. This isn't "indie rock" anymore, nor is it "dad rock", as some notable naysayers may want to peg it. No, this is "obligation rock": a forced brand of music that exists just because it has to. 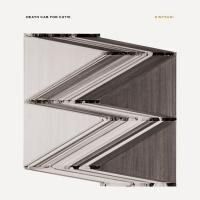 You'd think a band like Death Cab for Cutie would be above such pablum, but no, they soldier on sounding like they don't even want to be doing this anymore. Our best move as listeners would be to oblige them.